From film, to TV, to books, multi awarded actress and author Maricel Laxa-Pangilinan now ventures into an entirely new medium for her – radio. 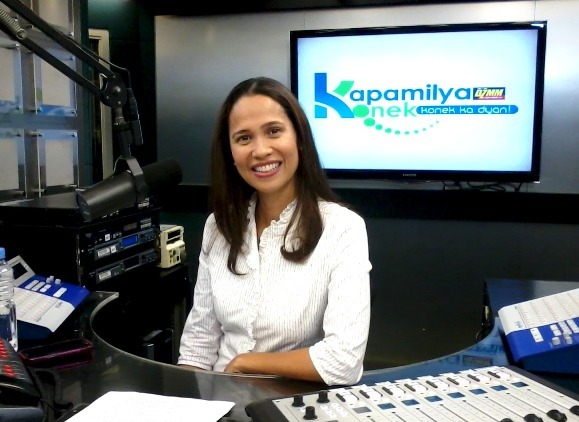 After several consultations with her family and some serious discernment, Maricel accepted to host the ABS-CBN Foundation’s Sunday radio program for the family, Kapamilya Konek. With a Master’s degree in Family Life and Child Development from the University of the Philippines, a wife to businessman and host Anthony Pangilinan and mother to Ella, Donny, Hannah, Benjamin and Solana, Maricel is the perfect anchor for the show as she brings to the table not only theories and principles but actual hands on experience. The weekly topics allow her to give her personal take on family issues and offer advice to fellow moms who are tuned in to DZMM 630 khz on local radio and through DZMM teleradyo and TFC for listeners from overseas. Kapamilya Konek links the Filipino families to experts, agencies and institutions that can help provide resources and expertise. Its initial episodes helped connect families with special children to appropriate institutions, parents who needed more information about the K-12 program to representatives from the Department of Education and children with issues with their parents and vice versa to professional family counselors. A special segment have also made it possible for separated families to be reunited by way of giving them free tickets to different local destinations via sea travel. Kapamilya Konek airs Sunday, 5-6 PM over DZMM. For more information, visit Kapamilya Konek DZMM on Facebook.